Another amazing box from Glossybox! / Gee Whiskers! Another amazing box from Glossybox! I've gotten every Glossybox since its launch in February this year and every single box seems to take my breath away. The May box was filled to the brim with such a wonderful mix of products and a big surprise in the form of a beautiful floral scarf from 4flavour. My personal favourite from the May box has to be the L'Occitane Immortelle creams. They are a serious indulgence! Gatineu Aquamemory Mask (RSP: R350 for 75ml) Received a 15ml sample which is worth R70. Gatineu Activ Eclat Flash Radiance Serum (RSP: R575 for 30ml) The sample size is 5ml and is worth around R95. L'Occitane Immortelle Divine Cream (RSP: R1100 for 50ml) Received 2 1ml samples. 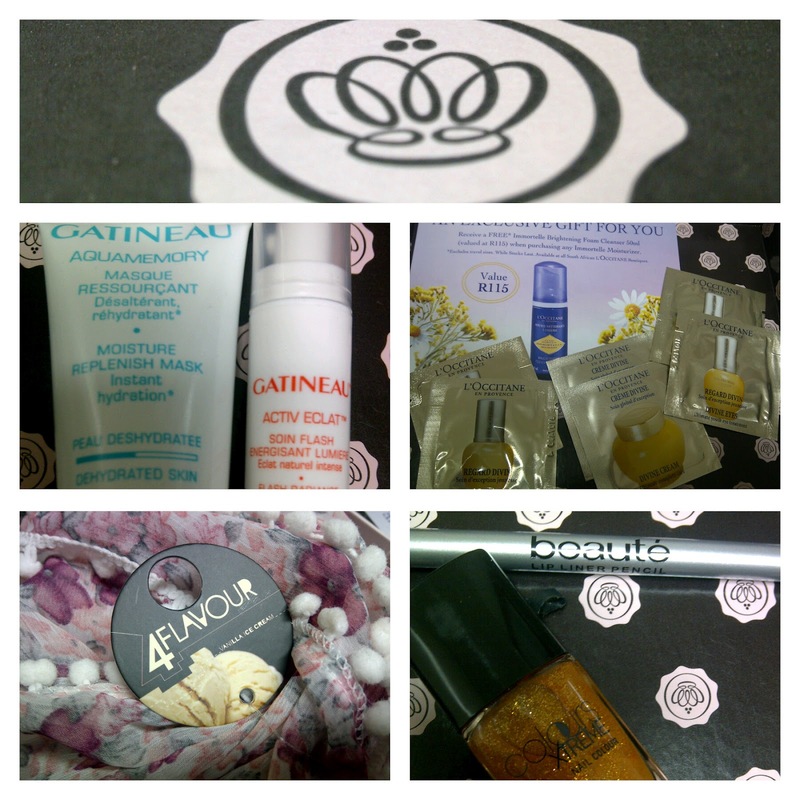 L'Occitane Immortelle Divine Extract (RSP: R650 for 30ml) Received 2 1ml samples. L'Occitane Immortelle Divine Eyes (RSP: R650 for 15ml) Received 2 1ml samples. 2 L'Occitane vouchers for free Immortelle Brightening Foam Cleanser when purchasing any Immortelle Moisturiser. Unfortunately the cost of these creams are way out of my price range so I won't be able to use either of these vouchers. 4flavour Scarf (RSP: R150) This is a beautiful feminine floral scarf that will add a bit of summer to the approaching winter days. Beaute Lip Liner Pencil *FULL SIZE* I received number 4, called Sangria. Colour Xtreme Nail Colour *FULL SIZE* I received a colour called Fairy Dust. Don't forget that Glossybox has a special limited edition Stuttafords box that will be arriving early in June. Make sure to get your box soon before they all run out! Great post. I'm actually thinking of getting the June box! I've already secured a box for my Mom and I. From what I've heard it is going to be AMAZING!